Finally implementing that New Year's resolution to get fit and lose weight starts with the perfect workout location. For those who choose to skip the commercial gym and instead create their own personal, at-home workout space, SMART Carpet and Flooring. Finally implementing that New Year's resolution to get fit and lose weight starts with the perfect workout location. 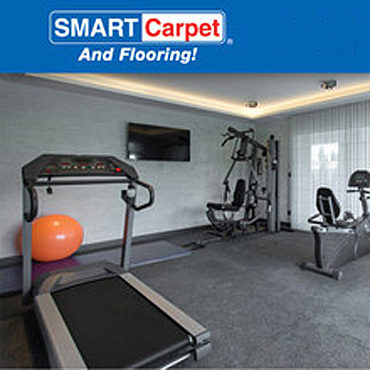 For those who choose to skip the commercial gym and instead create their own personal, at-home workout space, SMART Carpet and Flooring (https://www.smartcarpet.com/) has a mobile showroom with a large variety of get-fit flooring choices: from rubber to vinyl, as well as turf and traditional carpet. Rubber flooring is the most common choice for commercial gyms due to its strength and durability, though it is also appropriate for the home gym as well. Rubber is waterproof, soundproof, readily absorbs shock, relatively easy-to-install and available in smaller tiles and mats for those who want supplemental rather than wall-to-wall coverage. Rubber is a multi-purpose floor covering, especially useful in areas with heavy pet and foot traffic. It is also a good choice to use with heavy exercise equipment. Excellent slip resistance, allowing multiple exercise movements and intensities. Materials that are non-porous and made from recycled products. Shock-absorbing, allowing the most strenuous of exercise activities. Noise-reducing properties that help shield the rest of the home from exercise noise. Materials that are extremely durable and chemical resistant. Rubber flooring in general comes in multiple price points, with recycled rubber usually being the most affordable, while vulcanized or virgin rubber can cost much more. Customers are welcome to ask SMART Carpet and Flooring experts about these differences. For those who want their gyms to feel more like an in-home space, vinyl is often a more pragmatic choice. It is still durable enough to handle all of the rugged abuse that floors take in a gym, yet is stylish enough to meet the most discriminating home décor needs. Turf and carpeting are among the most popular choices for home gyms. Turf can boost athlete performance and is perfect for sled pulls and plyometric exercises, while carpet is kid- and pet-friendly, comfortable and widely versatile. Carpet also comes in a near-endless variety of styles, fiber lengths (high pile vs low pile) and colors, though it is generally advisable to stick with low-pile carpet to reduce the chances of tripping while exercising. SMART Carpet and Flooring experts are available for more detailed advice regarding both carpet and turf choices. SMART Carpet and Flooring maintains an exhaustive line of flooring to suit any flooring job. Home and business owners can choose from literally thousands of rubber flooring, carpet, wood, tile and vinyl brands — all from a mobile showroom ready to appear at a customer's request.